Have you ever wanted, or needed, to block an entire website from loading on your computer? Perhaps you’re having problems with your kids getting on Facebook, or maybe you have other websites that are being loaded on your computer that you simply do not want people to access. I faced this problem last night for the very first time. Someone I know has young kids in their house who were becoming very active on Facebook. Everything has been somewhat ok up until the messages and updates were starting to go WAY over the top. 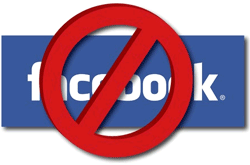 So after a bit of research I was finally able to figure out how to block Facebook, or any website for that matter, from loading on your computer. This works for any existing website, and any URL (specific pages of a website) that you might need or want to block from loading on your computer. Any computer (laptop, desktop, netbook, etc…) that accesses the internet has what’s called a “hosts” file. This host file is basically what connects the internet (outside websites and servers) to your local computer (the computer you are sitting at). So we need to first open this file, which is pretty easy to do. Now that you’ve copied the sting of text above, click on the “Start” button at the bottom left of your computer, and then find “Run” and click that. Paste the line of text above into the “Run” box. If you followed the steps above properly, then you’ll be looking at your “Hosts” file which is really nothing more than a text document. Directly underneath that line is where you want to add the sites you don’t loading on your computer. For example, the person I was helping last night wanted Facebook blocked from their computers so this is what I added to their file. I added the facebook both with and with the “www.” because sometimes will type it with the “www.” and sometimes not. And in order to ensure the site cannot be accessed, then both URL’s need to be specified. Again, blocking sites like this is highly effective for the webpages that you specify. If you don’t get the webpage address right, then the site won’t be blocked. Now that you’ve added the sites you want to block, and you followed the instructions properly above, it’s time to save the “hosts” file. Simply click “File > Save” on the text document (the “hosts” file document). And now click “File > Exit” and your text document will close. Now just open a web browser and test it out. Type in the website address you added to your “hosts” file and if everything was done right, then the site will not load. So basically last night I was able to block Facebook from loading altogether on this person’s home computer. If something isn’t working right, post it in the comments below and I’ll take a look. well my friend I tried to do what was suggested, however it will not save access denied even though I am the administrator. Any suggestions on how to get around this would be greatly appreciated. I run the computers for a women’s battered shelter and we do not want them on any social network where they can be traced.